It isn't in English yet, but you can get it auto-subtitled in Japanese (turn on CC) and then you can have those translated into English (under the gear-shaped settings icon). But the result is so dadaesque, I'm compelled to question whether it's actually even drawing from the correct source material. During the intro: "Cities and provinces of the announcement 667 the environment In addition That's 24 people the elderly, et al. 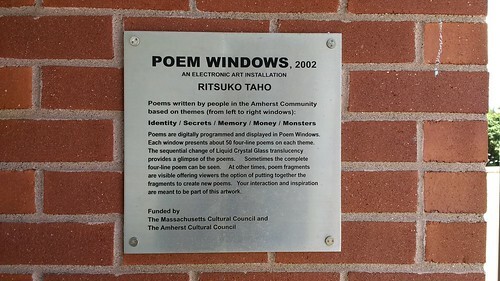 The date of manufacture i.org solid"
When Tohru guns down Emma in the back, she says "Two of people in advance rice to each computer". When Kobayashi-san is looking at at a computer game screen "For example, it has been found in liaison ipod dealer has entered". In another spot "Comments and was confirmed inform in such growing more anxiety." But, please! 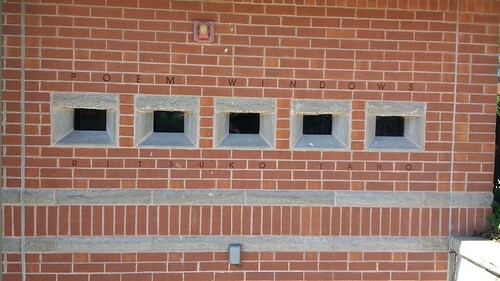 Tell me again how machine translation is going to solve the world language problem. 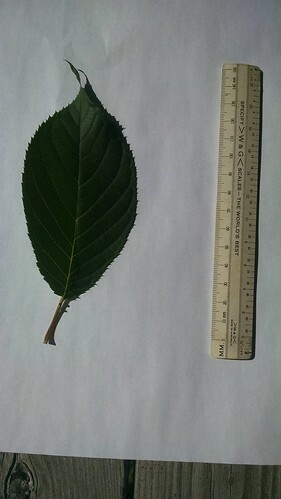 To get ready for the class, I've decided to start collecting leaves and post blog entries about what I find. 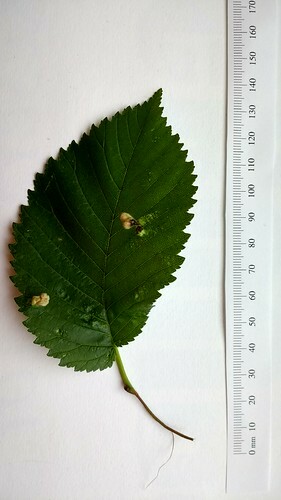 Figure 1 shows a Betula leaf. 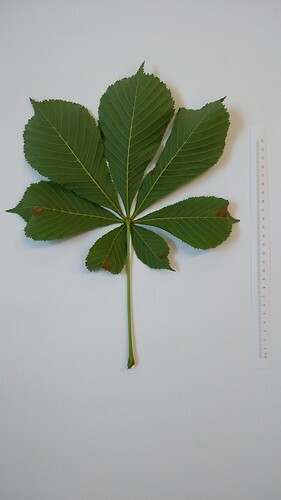 This leaf was collected from a small tree that was recently planted near the Morrill Science Center at UMass Amherst. I included a paper ruler in my photograph for scale. I was interested in the leaf because it has small holes in the middle. 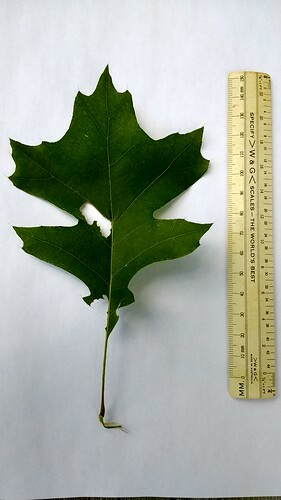 Note: these posts are not intended to be any particular model for writing for your blog posts: like your blog posts, these are just rough bits of text I'm using to document my own investigation of leaf size. Figure 1. 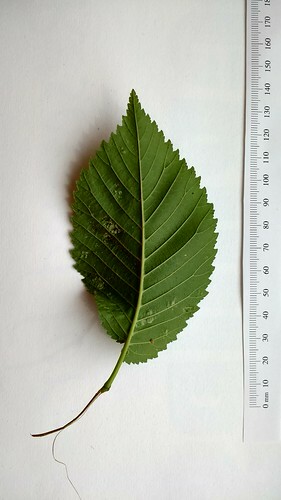 Betula leaf. 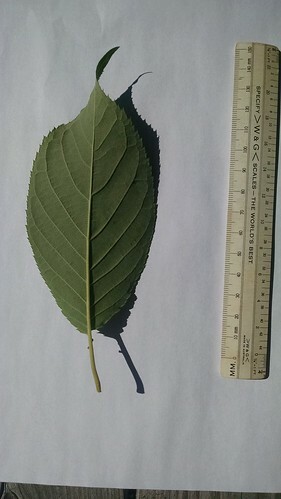 Upper side of leaf is on left. 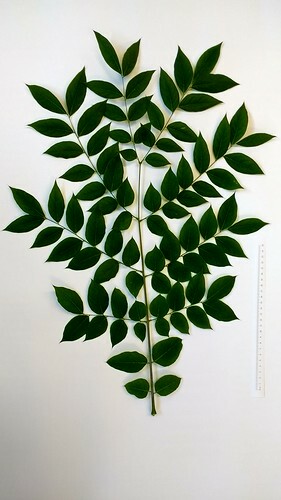 The leaf is approximately 8cm in length and 3.5cm in width. 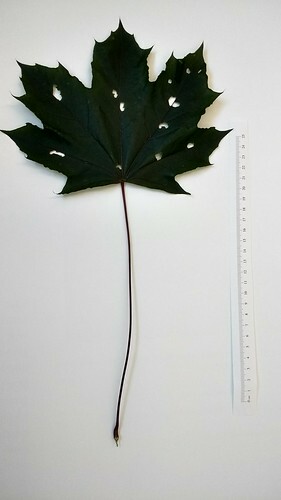 The stem is 1.5cm. 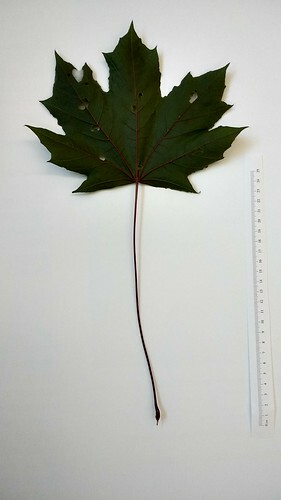 The leaf is heart shaped, with a serrated edge. The teeth seem to be of two sizes: some are 2mm and others only 1mm in length. 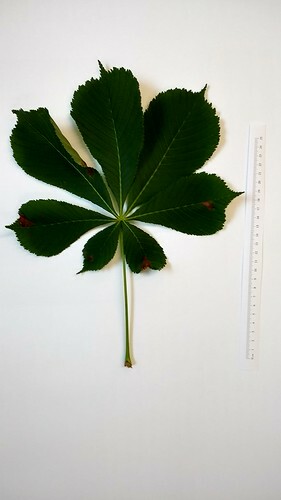 The leaf is asymmetrical with alternating venation. 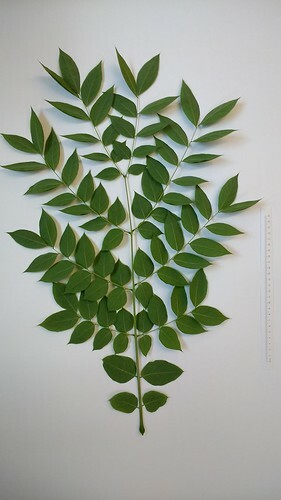 There are approximately 8 major veins on each side of the leaf. 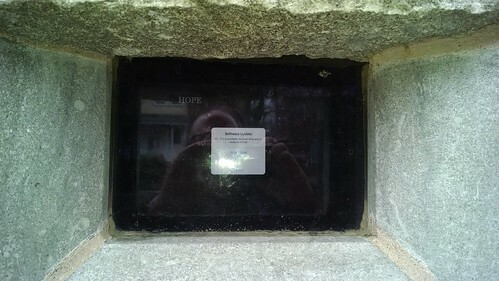 The upper surface is dark green. 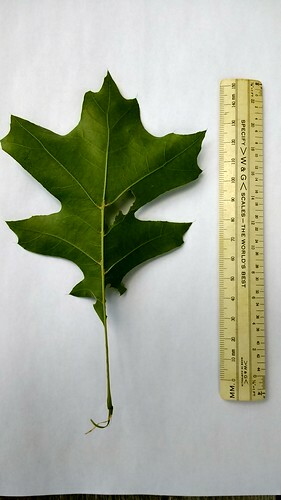 The under surface, the veins, and stem are a lighter green. 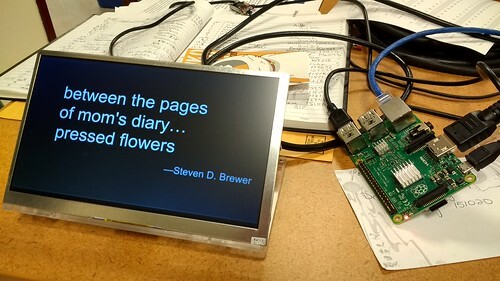 The stem is browish toward the end. The tips of the teeth are a pale, almost yellow green. 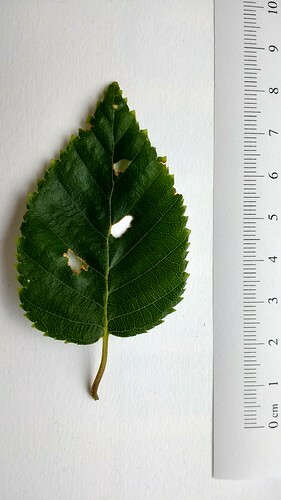 There is a white spot at the lower, left side of the upper surface of the leaf. The leaf has four holes. Each hole has brown leaf matter around the edge, suggesting that the hole generated by damage to the leaf. 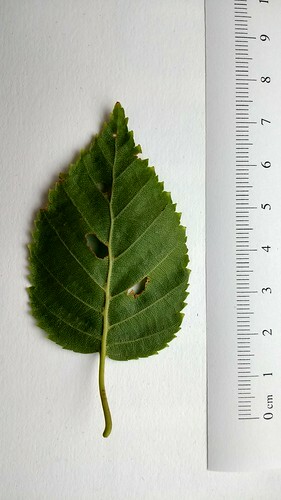 The holes tend to be along the edges of veins. there is also some damage along the edge of the leaf, a tooth that is partly torn off and at the very tip of the leaf.